By more than doubling the salary level test, the rule would have made it unnecessary for employers to even consider an employee’s duties in many cases. If the employee’s pay fell under the threshold for exemption, the duties would be irrelevant — the employee already couldn’t be exempt. The proposed rule raises the total annual compensation requirement for HCEs to $147,414, and HCEs also must make at least $679 per week on a salary or fee basis without regard to the payment of nondiscretionary bonuses and incentive payments. But it would allow employers to use nondiscretionary bonuses and incentive payments (including commissions) that are paid annually or more frequently to satisfy up to 10% of the standard salary level test. This means an employee’s production or performance bonuses could push him or her over the threshold and into exempt status (assuming the salary basis and looser duties tests are satisfied). A catch-up payment is allowed for employees who don’t earn enough in nondiscretionary bonus or incentive payments in a given 52-week period to meet the HCE salary threshold and retain his or her exempt status. Within one pay period of the end of the 52-week period, the employer can make a payment of up to 10% of the total standard salary level for the preceding 52-week period. This payment will count toward only the previous year’s salary amount — it doesn’t count toward the salary amount in the year it’s paid. The duties test isn’t the only part of the existing rules that wouldn’t change under the proposed rule. 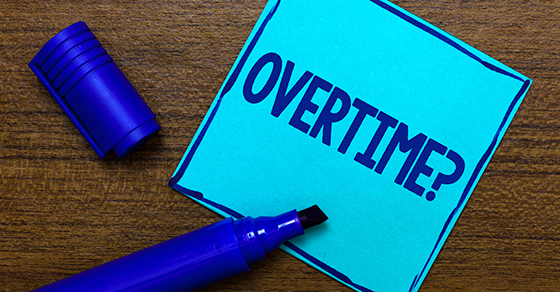 No changes are made to the overtime protections for certain categories of employees, including police officers; firefighters; paramedics; nurses; and specified nonmanagement employees, such as production-line employees and maintenance and construction workers. The proposed rule also leaves out the automatic adjustments to the salary thresholds that were included in the Obama rule. The DOL acknowledges, though, that such thresholds can become “substantially less effective over time.” It proposes updates every four years and solicits public comment on how best to implement these future updates. The DOL has solicited public comments on the proposed rule and indicated it expects the finalized rule to take effect on January 1, 2020. Legal challenges are likely from both business and worker groups, though. Some have questioned whether the DOL even has the authority to base overtime eligibility on salary levels. Stay tuned for more developments.